Bien Nacido (Spanish for “Born Well”) Vineyard of Rancho Tepusquet is one of the Central Coast’s premier sources for Chardonnay (over 300 acres) and Pinot Noir (over 250 acres). A number of other promising varieties are planted as well including Viognier, Pinot Blanc, Pinot Gris, Rousanne, Merlot, Barbera and Nebbiolo. The total acreage is fluid as old vines dating to the 1970s are removed and replanted. Maximum vineyard size is 800 acres. The vineyard is a few miles east of the town of Santa Maria and lies in a valley that is open to the Pacific Ocean to the west. There are regular summertime afternoon cool breezes from the ocean. Since the vineyard lies at 34 degrees latitude, it receives considerable intense sunlight from a directly overhead sun. Most of the vineyard is allocated to small producers whose blocks are farmed according to their standards. The grape production is sold to customers by charging a flat rate for the block or rows, so the winemakers can crop their vines to the volume they prefer. Some Bien Nacido customers have sourced the same rows of grapes for over 20 years and designate their particular block on the bottle. The entire Bien Nacido Vineyard client list is on the website. 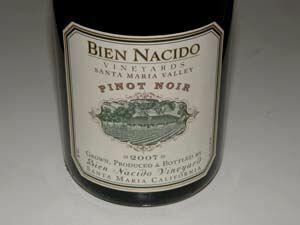 A Pinot Noir under the Bien Nacido Vineyards label was first released in the 2007 vintage. Trey Fletcher, most recently at LIttorai, became the winemaker for the Bien Nacido Vineyards and Solomon Hills Vineyard labels in 2011.